The goal of the “Hello world” module we’re creating in the example is to control a program on our system named “testConnection.py”, which is part of the example package available on GitHub. It will try to send an email using plain smtp and will respond with a json text message about the result of that attempt. Our application will need some settings to operate correctly, like an ip address and an email address and we need to be able to run that application. Because this application returns some valuable data for our users, we need to be able to fetch the response data back. For all OPNsense modules and applications there are some basic style and coding guides which you should use. Please use PSR-2 style (http://www.php-fig.org/psr/psr-2/) for all new code. Always make sure there’s a clear separation of concerns, back-end calls (like shell scripts) should be implemented using the configd system, all communication to the client should be handled from an API endpoint. (the example provides more insights on how this works). Back-end programs should not access the config.xml directly, if data is needed let the template system handle the desired output (most applications, daemons and tools deliver their own desired configuration format). There’s generally no good reason to avoid the standards that are already there. If you follow this basic rules, you’re automatically building a command structure for the system administrators and provide a connector to third party tools to the API of your component (as of version 16.1). 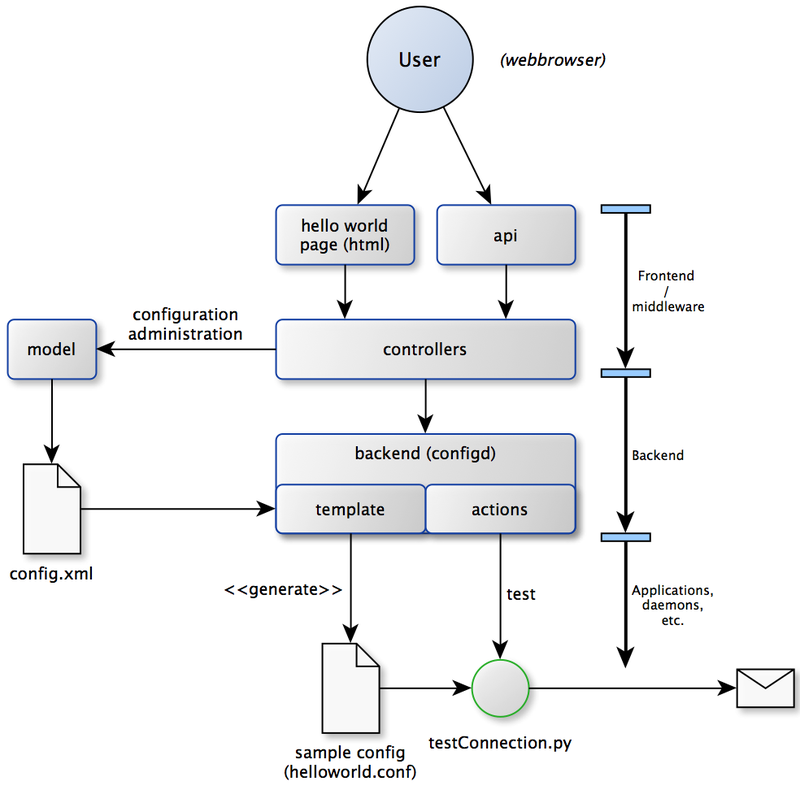 First step for our project is to build a skeleton which holds the structure for our frontend/middleware. For our sample application we want to setup some configuration data, which for all new style projects should live in it’s own model. 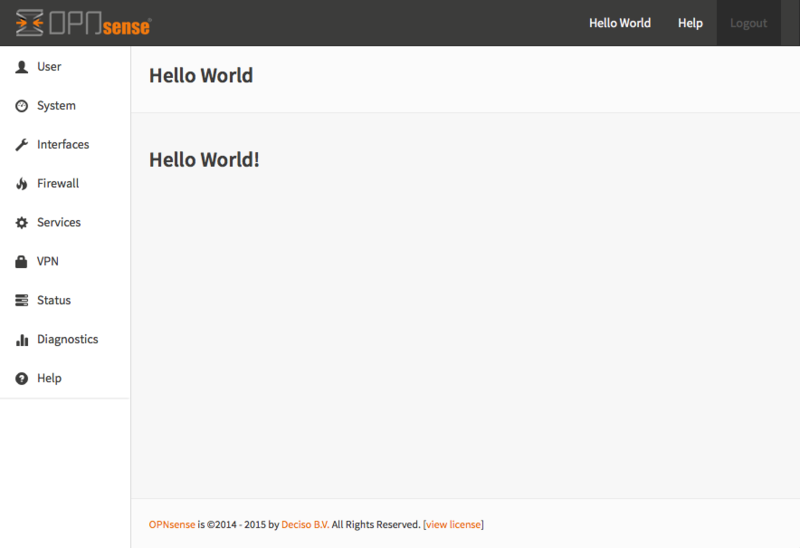 First we start by creating two files inside the models/OPNsense/HelloWorld directory. The first one is the boilerplate for the model class, which should contain model specific methods and (by deriving it from BaseModel) automatically understands the second file. Not all modules contain additional code in the PHP class, sometimes all the standard behaviour is already sufficient for your modules/application. The content of the mount tag is very important, this is the location within the config.xml file where this model is responsible. Other models cannot write data into the same area. You should name this location with your vendor and module name to make sure others could easily identify it. Use the description tag to identify your model, the last tag in place is the items tag, where the actual definition will live. We leave it empty for now as we proceed with the next step of creating our skeleton. We should add a (Volt) template to use for the index page of our module; we will use the same naming convention here. Next step is to add controllers, which will be automatically picked up by the system routing. A controller connects the user interaction to logic and presentation. Every OPNsense module should separate presentation from logic, that’s why there should always be multiple controllers per module. // pick the template to serve to our users. 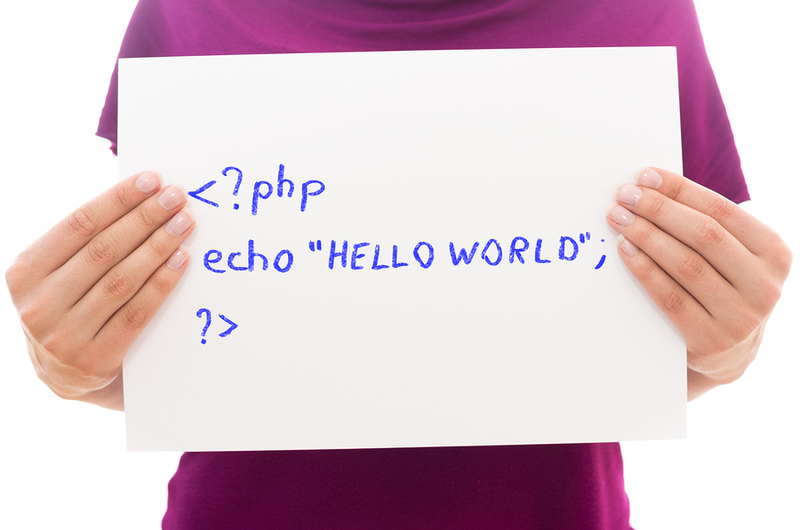 Which should serve you the “Hello World!” text you’ve added in the template. Next two controllers we are going to create are to be used for the api to the system, they should take care of service actions and the retrieval/changing of configuration data. They should live in a subdirectory of the controller called Api and extend the corresponding class. The first step in building forms is to determine what information we should collect. General.Description <empty> Description, used as subject of the email. All available field types can be found in the models/OPNsense/Base/FieldTypes directory. If specific field types support additional parameters, for example for validation, they should be registered in the model as well (just like the default tag in Enabled). This tells the template system to add a form using the contents of generalForm and name it frm_GeneralSettings in the HTML page. Based on a standard template part which is already part of the standard system, named base_form.volt. The framework provides some helpful utilities to get and set data from and to the configuration XML by using your defined model. First step in binding your model to the system is to add a method to the SettingsController to fetch the data from our configuration (or provide the defaults if there is no content). Which includes our model into the controller. Next we create an action to get data from our system, and put it into a json object for the client (browser) to parse, by using the wrappers already in our model. You will probably notice the return value of the action, it’s a standard array which uses “helloworld” for all attributes from getNodes() which will automatically be converted by the framework to a json object for the client. The getNodes method itself returns a tree a values, as defined by your model. Now we need to link the events to the backend code to be able to load and save our form, by using the OPNsense libraries you can validate your data automatically. // place actions to run after load, for example update form styles. // action to run after successful save, for example reconfigure service. Let’s give it a try and save our data, without modifying it first. Our basic module provides a way to read and modify configuration data using the web interface (and in time also other consumers using the api). Next step is to add some activity to our system, all backend applications should use their own configuration, which in real life we would keep as standard as possible. For our example we will follow the same process as for any other service and start writing some configuration data for our sample application. Which means, creating a template and hooking it into our save action. 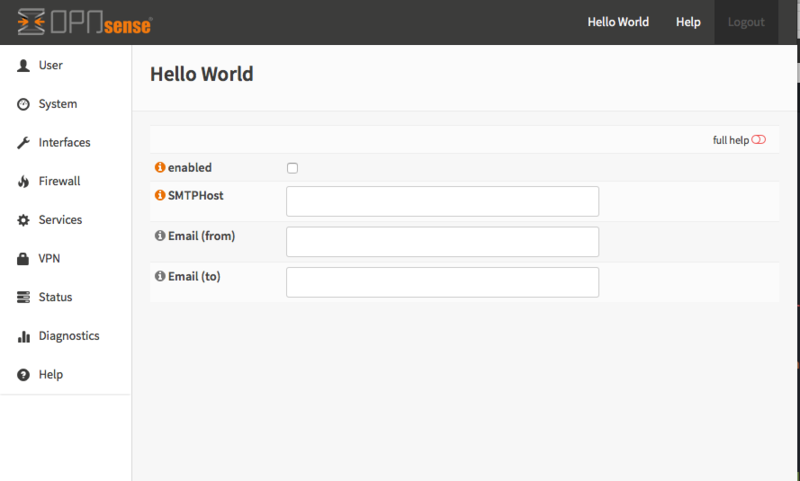 Next thing to do is create that helloworld.conf file in the templates directory. We will keep things very simple for this one and just copy in our data into an ini file structured configuration, when the module is enabled. This validates the type of action (it should always be POST to enable CSRF protection) and adds a backend action for reloading the template. When successful the action will return “status”:”ok” as json object back to the client. Now we are able to refresh the template content, but the user interface doesn’t know about it yet. To hook loading of the template into the save action, we will go back to the index.volt view and add the following jQuery / framework code between the braces of “saveFormToEndPoint”. What have we accomplished now, we can input data, validate it and save it to the corresponding format of the actual service or application, which uses this data. So if you have a third party application, which you want to integrate into the user interface. You should be able to generate what it needs now. (There’s more to learn, but these are the basics). But how do should we control that third part program now? That’s the next step. Instead of running all kinds of shell commands directly from the PHP code, which very often need root access (starting/stopping services, etc. ), we should always communicate to our backend process which holds templates of possible things to run and protects your system from executing arbitrary commands. First thing to do when registering new actions to the system for a new application is to create a config template. Which should return some response in json format. Next step is to use this command in our controller (middleware), just like we did with the template action. For consistency we call our action testAction and let it pass json data to our clients when using a POST type request. Now go back to the page and save some data using the save button, next press test to see some results. OPNsense is available in may different languages like english, german or japanese. This works because we are using the gettext library which is available to all GUI components. While the XML based user interfaces are supporting it automatically, there may still the need to call it manually (buttons, tabs etc.). If your string is not only plaintext because it contains non-static words, HTML tags and other dynamic content, you need to use a format string. This way, you can use placeholders for such elements which should not land in the translation file. You should NEVER split strings which should belong together like a sentence. This makes plugins hard to translate and will decrease the quality of OPNsense in other languages. Most modules and applications need a place in the menu system, you could easily arrange that by creating a Menu.xml definition for your module in the model directory under Menu/Menu.xml. When you refresh your page now, you should notice the menu system automatically picks up this new information. This creates an ACL key named “page-user-helloworld” which authorizes access to both the ui and API urls of this application. You can now grant access to this module from the system user manager. Next add a +POST_INSTALL file in the plugin directory, to reload the configd process after installation. This is needed for the new “test” command to register.